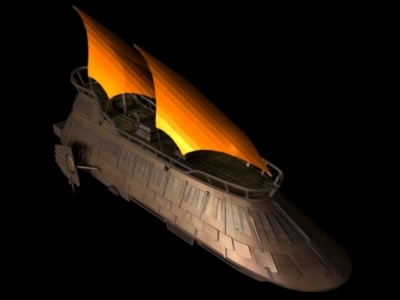 The Seltiss-2 caravel was designed to be a cheap alternative to the popular, but expensive luxury sail barge. Essentially a scaled down version of the luxury model, it has half the capacity, passenger space and repulsor lift power of its predecessor. The repulsors are so limited that the barge cannot traverse rocky areas. However, the smaller size and lighter repulsor units allow it to travel twice as fast. Since the Seltiss model was not intended for the wealthy, who are popular targets for pirates and bandits, its designers opted to strip out most of the weaponry and armor. The budget analysts also deemed it necessary to remove most of the luxury facilities from within the vehicle to keep production costs low. However, many Seltiss-2 owners have after-market weapons and upgraded amenities installed. Likewise, extravagant customization of the barge, reflecting the owner's unique taste, is a well-documented and popular pastime.